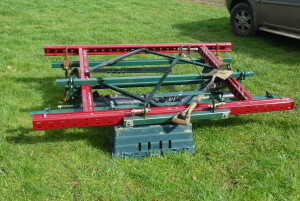 Last season we had a machine (devised by Mr Rusby and therefore christened the ‘Rusby Wrapper’) to help us lay biodegradable cornstarch on the Go Local Fields. 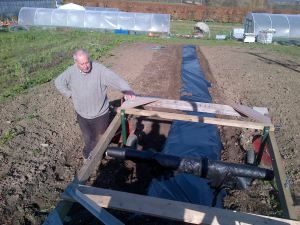 This helped to warm up the soil and keep down the weeds – an excellent labour saving device. It worked but it was decided that although it was a good start, better could be done. Over the Winter, work has been going on to create the Rusby Wrapper Mark 2 which has already proved invaluable this year.